All players in a group hit their first shot and then proceed to their second shot as a group. The person, whose ball is closest to the hole, hits their second shot first. Pick up your ball after playing two strokes over par and proceed to the next hole. If you hit your ball out of bounds, pick up your ball, place it two club heads from where it went out. Add 1 penalty shot to your score. If your ball lands in the water please use the ball nets to retrieve your ball. If an obstacle prevents you from putting, you may move the ball two club heads away from the obstacle and proceed with play. For the safety of yourself and others, please stay on the walkways. No full swings with putters are permitted. No sharing of putters or balls are permitted. The Tower of Terror Hole-in-One challenge does not form part of the 9-hole Mini Golf Course. 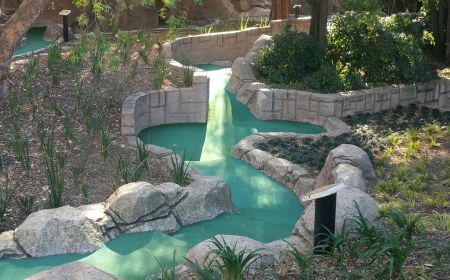 The players of Turtle Creek Adventure golf use the facilities at their own risk. The Tower of Terror Hole-in-One challenge costs R10 per try. Once payment has been made the player will receive a yellow ball. Players must get the ball into the hole on their first try. Should the ball roll back, the player may not attempt a second shot and must hand the ball back to the operator or alternatively pay for another chance. The free game will be issued to the guest once the yellow ball has run into the operators hut. If a player fails to comply with these rules, they will be disqualified and no prize will be awarded.